Texas Southern University is a four-year, state-supported, coeducational liberal arts university fou…. Texas Southern University is a four-year, state-supported, coeducational liberal arts university founded in 1947 to serve the black population of Texas. Established as Texas State University, the name was changed to its current name in 1951. In 1973, partially as a result of its metropolitan location, TSU was redesignated as a “special purpose” institution of higher education for an urban population. Such special programs include projects through the Mickey Leland Center, established in 1989 as a national resource center to study contemporary issues that have an impact on world hunger and peace. The program continues the work of the late Congressman George “Mickey” Leland. Although the University maintains a selective admissions policy for its graduate and professional programs, TSU maintains an open admissions policy for undergraduates in an effort to attract the diverse ethnic population of its inner-city location. As a comprehensive university, TSU offers academic programs in the arts and sciences, business, education, pharmacy, technology, and law. It also provides social services for the campus and the community at large. TSU is situated on 130 acres with twenty-seven buildings. Facilities include the Terry Library, the Nabrit Science Center, the King Humanities Center, and the Thurgood Marshall Law Library. Contemporary facilities are constructed of Texas Cordova shell stone. 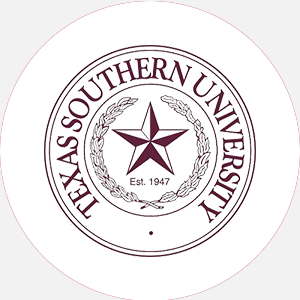 Texas Southern is accredited by the Southern Association of Colleges and Schools to award the Bachelor of Arts, Bachelor of Science, master’s, and doctoral degrees. Graduation from an accredited high school (or equivalent) and completion of the following 16 units: 4 English, 1 algebra, 1 geometry, 1 natural science, 1 social science, and 8 academic electives. Students must submit an official high school transcript with a minimum C average and proof of immunization against tetanus/diphtheria, rubella, polio, and smallpox. Students must complete the Texas Academic Skills Program (TASP) and attend an orientation for new students. A application fee is required. A minimum of 124 credits and completion core requirements to include the following hours: 6 freshman English, 6 sophomore English, 6 American history, 6 U.S. and Texas government, 6 math, 8 natural and/or physical science, 3 aesthetics, 2 health education, 2 physical education, and 3 speech; maintain a minimum 2.0 GPA and B average in major; last 30 hours and at least 2 semesters must be in residence at TSU. Campus Regulations: Cars must be registered; curfew; guest hours; dorm visitation hours; class attendance mandatory for freshmen, sophomores, and students on probation; graduating students must attend commencement. Campus Services: Health center; personal and social counseling (psychological counseling provided by community mental health agencies); career counseling and placement; legal services; testing center for ACT, MCAT, GMAT, SAT, TOEFL, and GED; tutoring and remedial assistance; and religious activities. Campus Activities: Social and cultural activities include theater, chorale, band, dance, and lecture series. Students may get involved in the Herald (student-run newspaper) or the yearbook. Communications majors or volunteers may work at student-run radio station, KTSU. Leadership opportunities are found in the Student Government Association or the various other clubs and organizations. United Ministries is a program of interdenominational cooperation that ../includes the Baptist Student Union, Newman Club, Lutheran Student Organization, and the Wesley Foundation. Greek fraternities include Alpha Phi Alpha, Kappa Alpha Psi, Omega Psi Phi, and Phi Beta Sigma; sororities include Alpha Kappa Alpha, Delta Sigma Theta, Sigma Gamma Rho, and Zeta Phi Beta. Honor societies are also represented on campus. Housing Availability: There are 1,800 housing spaces, 600 of which are freshman-only. Married student housing is available.